Mashed potatoes with grilled potatoes. Delish! I’d like to introduce you all to the Klondike Rose potato. 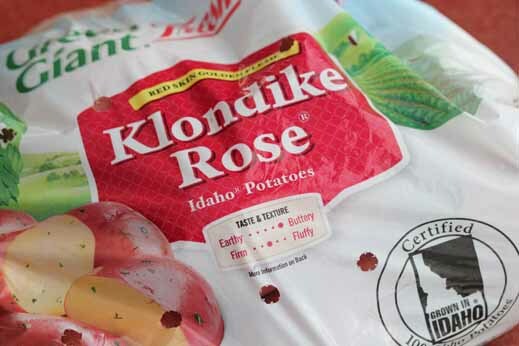 Take the buttery Klondike Rose potatoes. Season them with Johnny’s Seasoning Salt and some olive oil. Grill them in a grill basket. Mash with your favorite mix-ins. We all LOVED loved l.o.v.e.d. these potatoes. The smokiness from the grill and the seasoning salt made for a spectacular mashed potato side dish! Also…there is a coupon available right now on the Klondike website…be sure and print it before you head out to get your sack of potatoes! Yay for savings! And don’t forget to scroll down for the giveaway details! 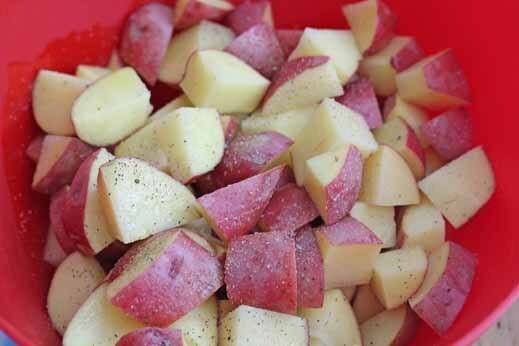 Toss the quartered potatoes with the seasoning salt and olive oil. 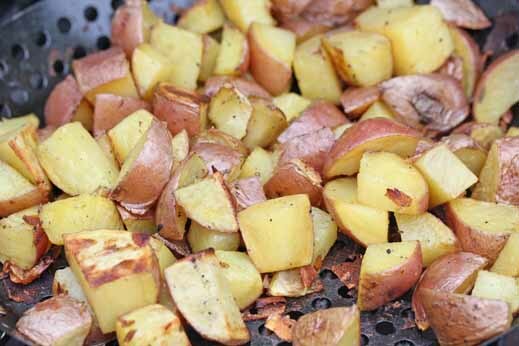 Place in a grill basket and grill over medium-high heat for about 20 minutes, or until potatoes are soft. Toss often to prevent burning. Once soft, mash the potatoes with a potato masher and mix in butter and milk or sour cream. 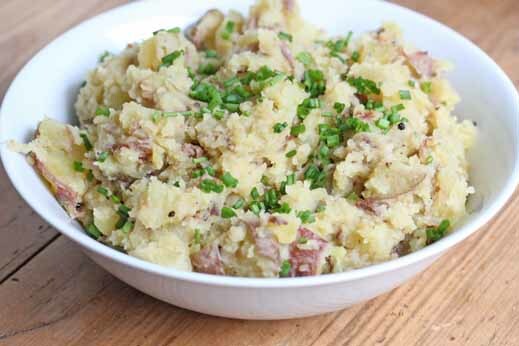 Top with chopped chives or other mashed potato mix-ins. Serve Grilled Mashed Potatoes with your favorite grilled meat and/or veggies. Spices and seasoning salts and other goodies. 1. Contest ends Friday, April 26th at 5 pm EST. CLOSED! Entry #1: Leave a comment sharing your favorite mix-ins for mashed potatoes! 2. Winner will be selected by Random.org.Winners will be announced back here on this post, and notified via email with further instructions. **NOTE: If you receive the email newsletter and wish to enter this giveaway, click on the title of this giveaway to get to the site and leave a comment on the site with your name and email address to be entered! Winners have been notified via email with further instructions. Disclosure: This is a sponsored post, brought to you by www.klondikebrands.com andwww.johnnysfinefoods.com. 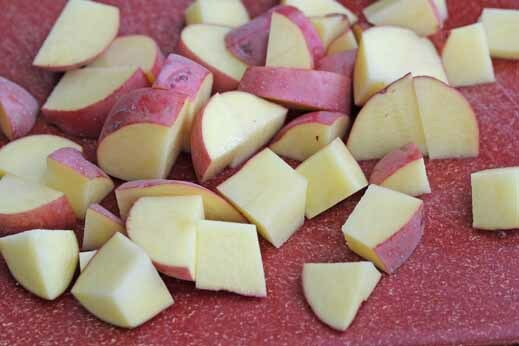 The Klondike Rose potatoes are delicious, as are these mashed potatoes. Opinions and recipes are my own. I “Like” Klondike Brands and Johnny’s Fine Foods on Facebook. My favorite mashed potato mix in is pesto. It’s great with greek seasoned salmon or lemon chicken. I love to mix in all sorts of things! Truffle oil and parm, parsley and scallions and roasted garlic, bacon and cheddar and sundried tomatoes….. Butter, garlic & cheese!!! Yummy!! Your grilled mashed potatoes sound delish!!! I tweeted about the Potatoes Prize Pack. I liked Klondike Brands & Johnny’s Fine Food on Facebook. I love mashed potatoes with Butter and Garlic.